Ok… Slurpy the rib first, so called because she slurps all the time when strung out behind Suliere at anchor. She all works – went for a ride today after they connected the gears and she is fine. So both ribs now fully working, clean and all checked out. The top down furling and sails arrive back on Thurdsady afternoon but the blotches all over the sail spotted on the first attempt to install the top down furling are caused by the darker blue leaching out over the lighter orange and will probably stay with the sail for the rest of its life …. do not store wet sails for long is the lesson. The gennaker was not really wet and was packed away in the tropics on a dry day so how come it ended up like this is a puzzle. 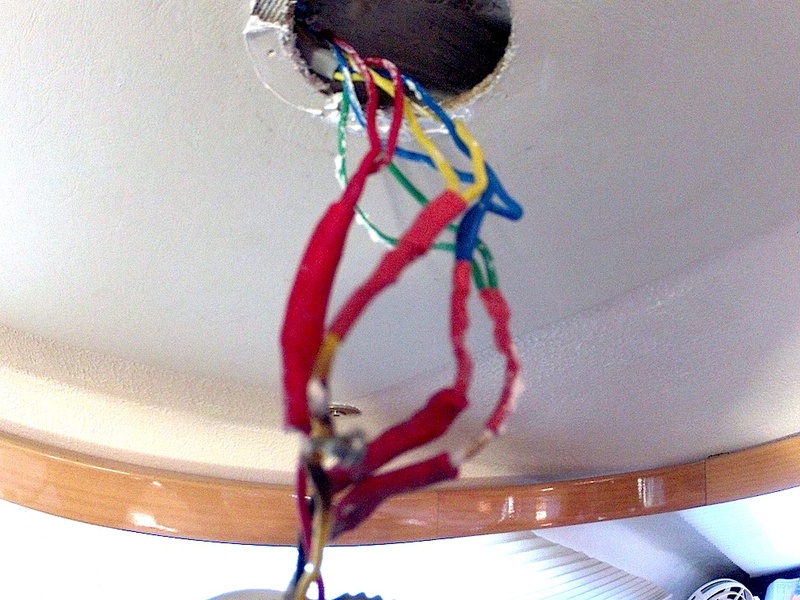 Yes each of the four strands has exposed copper wire ….. no wonder the LED failed! Thanks SFM, you certainly keep them coming. As it happens the distributor for the LEDs is also the distributor for Karver reefing systems so the rep is bringing some parts down for a set of 4 spares and the other parts are being posted to me. We simply adjusted the sspring that comes with these lights like we did to all the cockpit lights and it fits tight without the need for silicone. I think the attitude in SFM was simoly get them out of Africa as soon as possible rather than trying to do a proper job. More tests on the inverter tomorrow and as usual I am polishing, polishing polishing.